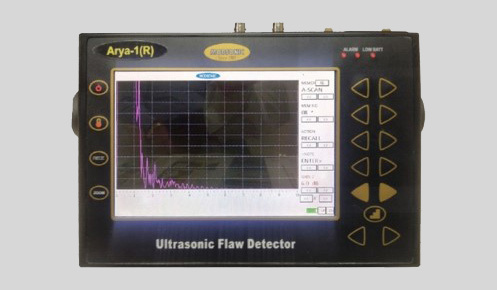 Special Ultrasonic Flaw Detector Approved as per RDSO Specification No M&C/NDT/125/2004, Rev-II, Jan.2017. Best for testing Railway Axels used in Locomotives, Carraiges and wagons. Inbuilt Memory of 10000 Trace and 100 Calibration set-ups. Facility for External Keyboard Attachment for feeding Note/Details & Labelling. Test Range 50 mm to 5 meter (in steel). Fine mode adjustable in step of 0.1mm or 1mm. Velocity 1000 m/s to 15000 m/s. Fine mode adjustable in step of 1 m/s. Delay Up to 3000mm. Fine mode adjustable in step of 0.01, 0.1 or 1mm. Gain 80 dB Operable gain adjustable in 0.5, 1, 2, 6, or 14 dB step. Rejection 0 to 100% FSH. Frequency 1 MHz to 6 MHz (Wideband). Probe Connectors BNC and LEMO Size-1 Both are provided. A-Scan memory 10000 Trace Patterns can be stored, recalled or transferred to PC via USB port with all Notes/Details. Calibration Set-up 100 different calibration set-ups can be Stored and Recalled. Software AryaSoft Interface software for data transferring, reporting and printing in PC. Direct Printing USB Port on the machine for direct printing by connecting the printer to the equipment. Display High Brightness Colour Wide TFT/LCD display (800×480 pixel, size 152.4 x 91.44 mm) for better signal representation and better visibility with 5 different colour sets. Dynamic DAC Dynamic DAC curve can be Digitally plotted on screen using minimum 2 to maximum 10 points. Digital Readout And Trig. Function Depth, Beam path, Surface Distance and Amplitude Level are displayed in digital readout directly. Power Lithium-Ion Battery pack 14.4VDC, 4AH. Size 155 x 248 x 72 mm (HxWxD). Weight 1.8 Kilograms with Battery.